Happy 2015, everybody! Hopefully the new year has been treating you well so far. 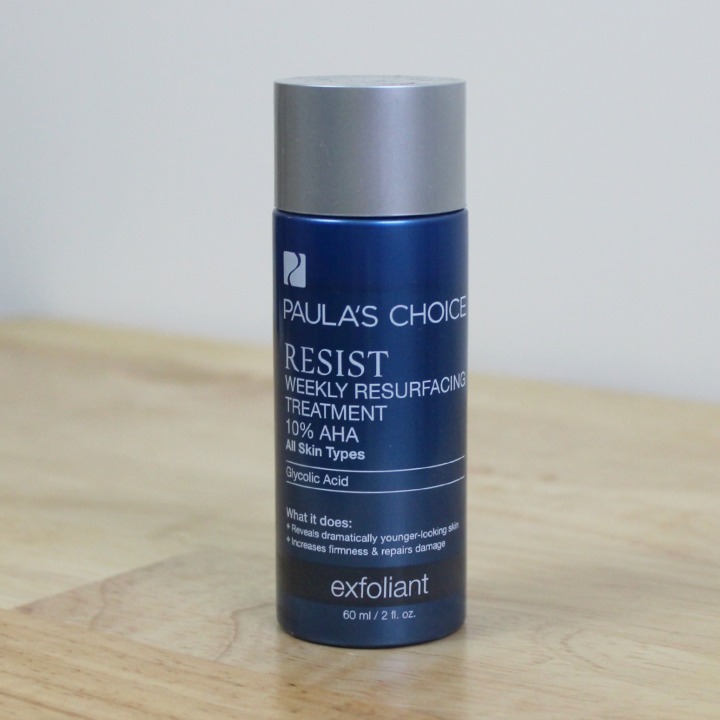 I was compiling a list of some of my favorite beauty (and non-beauty) discoveries of 2014, when I realized that I had never reviewed the Paula's Choice Resist Weekly Resurfacing Treatment with 10% AHA—an egregious mistake on my part, since it might be my favorite skincare product that I tried last year. In the top three, at the very least. Better late than never, I guess! Read on to find out why I love it so darn much. Good, good morning. This leave-on 10% AHA exfoliant reveals dramatically younger-looking skin. Overnight. Water, Methylpropanediol (slip agent/penetration enhancer), Glycolic Acid (alpha hydroxy acid/exfoliant), Butylene Glycol (slip agent), Aloe Barbadensis Leaf Juice (water-binding agent), Sodium Hydroxide (pH adjuster), Camellia Sinensis (Green Tea) Leaf Extract (antioxidant), Sodium Ascorbyl Phosphate (vitamin C/antioxidant), Dipotassium Glycyrrhizate, Glycyrrhiza Glabra (Licorice) Root Extract (anti-irritants), Vitis Vinifera (Grape) Seed Extract (antioxidant),Arctium Lappa (Burdock) Root Extract, Avena Sativa (Oat) Kernel Extract (anti-irritants), Borago Officinalis (Borage) Extract, Boerhavia Diffusa Root Extract (antioxidants), Chamomilla Recutita (Matricaria) Flower Extract (anti-irritant), Lamium Album (White Nettle) Flower Extract (antioxidant), Salix Nigra (Willow) Bark Extract, Salix Alba (Willow) Bark Extract, Ulmus Fulva (Slippery Elm) Bark Extract (anti-irritants), Glycerin (skin-identical ingredient), Allantoin (anti-irritant) Propylene Glycol (solvent), Tetrasodium EDTA (chelating agent), Phenoxyethanol (preservative). According to the Paula's Choice info page, the pH range for this product is 3.5-3.9 (which is acidic enough to be suitable for exfoliation). I tested it on one of those home test strip thingies and it also registered in that range. The primary purpose of this product is exfoliation, with Glycolic Acid being the star ingredient. I will say this: Some people don't seem to get on well with Glycolic Acid, but personally my skin seems to LOVE it. When I first tried the Resist Weekly Resurfacing Treatment (back in April or May of 2014) I wasn't really sure, so I purchased several sample packets first. One sample costs about a buck and is more than enough for one treatment, so buying a month or two's worth of samples is pretty practical if you're not sure how your skin will react. Aaaaanyway... as the name would suggest, this is meant to be used as a weekly treatment. The Paula's Choice FAQ does say that you can use it more than once per week if your skin can tolerate it—personally I use it once or twice a week and find that that's more than enough. Since this is a special, extra-strong treatment, you're supposed to use it instead of other exfoliating products—leave the BHAs and scrubs for another time. Fancy! I will say this: I don't buy Paula's Choice products because of the packaging. In this case the product is thin enough to dispense cleanly through the hole though, so I guess it's not a biggie. Experience the face tingling! AHHHHHH! Apply moisturizing serums and creams as usual. 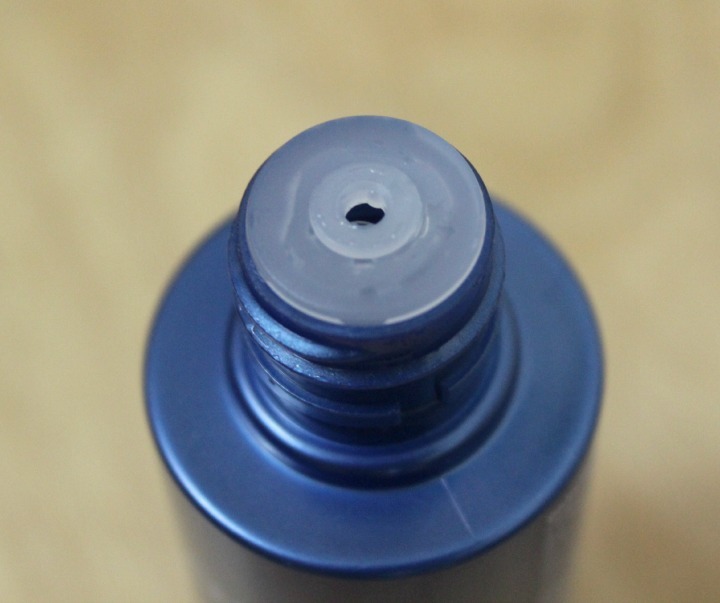 You can rinse the product off after ~20 minutes instead of leaving it on under your moisturizer if you find it too sticky, but I choose to leave it on because it contains several antioxidant ingredients that might be beneficial. And I don't find it overly sticky once moisturizer is applied on top. Your call! The tingling is no joke though—it's kind of like that pins and needles sensation you get from sitting on your foot, except in your face and kind of hot-feeling? Fun! That may sound awful, but I find it completely tolerable, and the flushing seems less extreme if I dry my face thoroughly before applying the product. Just saying. Other thoughts: Paula's Choice Resist Weekly Resurfacing Treatment doesn't have an especially strong scent—vaguely sour and chemical-esque, but nothing too awful. Don't get it in your mouth though. It tastes BAD. The Paula's Choice product page suggests that this is ideal for dry skin types, but I found it to be more than suitable for my combination skin. I didn't experience any flaking or "shedding" when I first started using it, but ultra-dry skin types might. Now that I've gone through all the particulars of how I use this product, let me explain why I love it so much: It has the most dramatic (and immediate) results of any chemical exfoliant product I've ever tried. My skin feels ridiculously smooth after using it, and when I wake up in the morning I have sort of a "glow" that I don't get from other exfoliants. I would use this product every day if I thought my skin could tolerate it, but alternating it with the Paula's 2% BHA Liquid, a Vitamin C serum and other, gentler treatments seems to be a reasonable compromise. I've been using both this and the BHA liquid for about six months now, and in that time I've had a DRAMATIC reduction in breakouts, and pretty much all of the hyperpigmentation I had left over from acne has faded. Seriously, I can't remember the last time I had a ridiculously painful cystic zit, and I used to get them all the time along my jawline. Not fun. I've had even better results using the Paula's Choice treatments alone than with my PocketDerm blend (which contained a low dose of Tretinoin, Clindamycin, and Azelaic Acid). At some point I hope to experiment more with higher concentrations of Tretinoin (or possibly OTC retinol serums), but in the meantime I think this is the best combo of anti-acne, anti-aging products I've been able to get my hands on without visiting an actual doctor. You can buy the Resist Weekly Resurfacing Treatment with 10% AHA from the Paula's Choice website, where it retails at $35 for 2fl oz/60ml (or $1 for a 1.5ml sample). That may sound sort of expensive, but a little goes a loooooong way and a 2oz bottle will last you several months. What do you think of the Paula's Choice Resist Weekly Resurfacing Treatment with 10% AHA? Do you have a favorite exfoliating treatment? I don't think I've ever tried an exfoliating treatment that wasn't some sort of scrub with gritty pieces in it. These are basically mild acids, so they exfoliate by eating away dead skin, for lack of a better explanation. The experience is totally different to using scrubs... there's something satisfying about the sensation of a scrub, but I think these work better in general. Worth a shot if you ever want to try something new! Ah I see...maybe I can get a sample of one. I love this stuff. The tingly sensation is not my favorite thing, but I know it's working! And yes, it tastes BAD. I use the Resist Daily Smoothing Treatment 5% everyday (it's great) and this maybe once a week. You should go say hi to Paula! ;) My skincare routine is a mishmash of different things right now. I have some drugstore products, mid-priced western products AND Korean stuff in there. Whatever works the best at the best price, right? Haha yes. It's hard not to get it in your mouth sometimes, but the results are... not delicious. I haven't tried the Resist Daily Smoothing Treatment yet, but now that I'm looking at it I'm sort of curious... I just picked up their Retinol serum though, so I should probably try that first! Ahh, that's too bad! My skin isn't very sensitive so the tingling is more of an odd sensation for me, but I can see how it could be uncomfortable for others. Have you tried any other AHA treatments? Another poster mentioned the Resist Daily Smoothing Treatment (which is 5%), and I suspect that's more gentle.